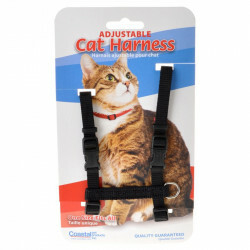 Welcome to the Cat Harnesses superstore! We want to help make keeping your pet safe and close as easy as possible. Our selection of adjustable cat harnesses is designed to do just that by providing durable yet comfortable restraint for cats that like to go on their own adventures. 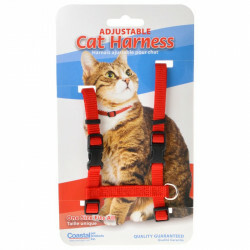 They're perfect for walks, tie-outs, or any situation where you need to keep your cat in a certain spot. At Pet Mountain, we are proud to carry the very best pet products from the most trusted manufacturers in the industry. 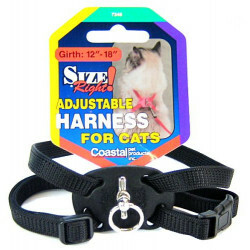 Our harnesses for cats come from Tuff Collar and Coastal Pet, both leaders in leashes and restraint technology. 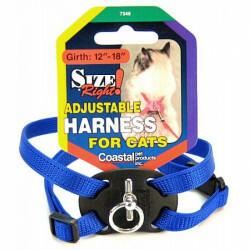 Made of durable, lightweight nylon, their cat harnesses provide your pet with ample room to move comfortably, without pinching the skin or coat. One size fits all!